1. 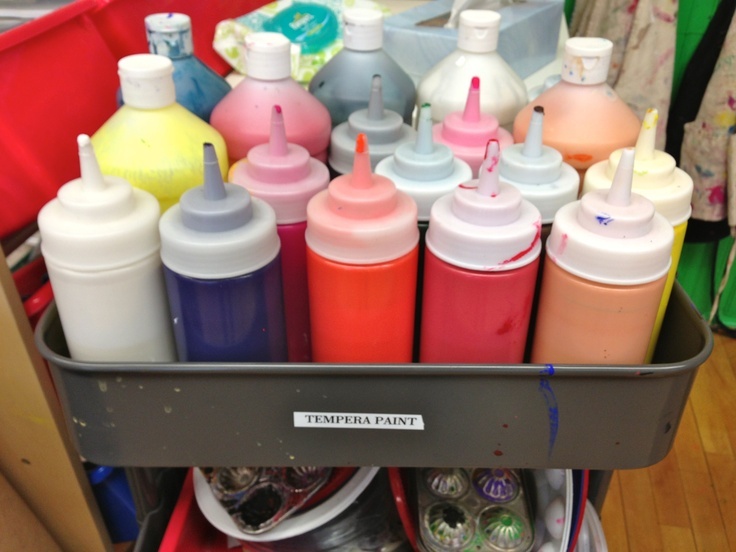 Store your leftover tempera paints in sauce containers. 2. Use rice to clean dirty pastel chalk. 3. Use a water squeeze bottle with your tempera paint cakes. No messy cups of water that can potentially be knocked over. 4. Keep paint in condiment bottles that kids can dispense independently. It eliminates waste because they only take as much as they need. Hand soap dispensers work, too, if you're into upcycling. 5. Let kids blot paint on wet sponges. No more soggy paper towels., meaning less money AND mess. 6. Need to gesso some canvases? Gesso spray paint is so much faster and easier than using a brush. 7. Have kids draw with white crayon and then watercolor over their designs. It's called "crayon resist" and it'll blow your kids' minds! 8. Use Starbucks cups as no-spill paint cups. 9. Turn your broken crayons into new crayons. 10. Repurpose makeup sponges to make your own dot dabbers. 11. Use plastic baggies on your water/paint cups to make cleanup a breeze. 12. Use colored sticker dots to keep track of supplies. Each table/group gets their own coordinated color — so no more mix-ups! 13. Soak your dried out markers to make watercolors. 14. Use a crab claw-cracker to undo tough glue caps. 15. Put glue caps on your acrylic paint bottles so kids can write with them. 16. Mix 1 cup of salt, 1 cup of flour, 1 cup of water, and food coloring in a condiment bottle to create cheap and easy paint. 17. A pencil eraser makes a great makeshift cap for paint or glue. 18. Soak your glue caps in a little vegetable oil to keep them from clogging. Your caps will be much easier to unclog, and they will clog less frequently. Full directions here. 19. Use an emery board to make a dirty old eraser just like new again. Use the board to file away the grubbier parts of the eraser. 20. Make your paintbrushes last longer by washing them with conditioner. 21. Store leftover paint in egg cartons in a plastic tupperware container. They'll last up to a week for reuse. 22. Kids can make super easy picture frames out of construction paper. Fold the paper into fourths, cut out an L shape, and then cut a jagged or scalloped design along the outer edge. Still confused? Get the full directions here. 23. It's incredibly messy, but did you know you can freeze tempera paint? Apparently the kids love it. Read more about it here. 24. Display the art and cards that students give you. "When a student proudly brings me a card or drawing, I read it and tell them how wonderful they are, and then direct them to the Cards to Remember book. They add their card or drawing to the binder. I leave the binder on display so other students can look through it." Such a sweet idea! Read more about this system here. 25. Make your own watercolors out of just two ingredients. Baking soda, food coloring, water, and ice cube trays are all you need. Get the full directions here. 26. Use a dropper to make a huge array of watercolor shades. By just starting out with two pools of yellow and two of blue, the student can eye-drop those paints into other pools of plain water to create a gradient of different colors. 27. Use painter's tape and hot glue to hang artwork on the wall without taking paint off. 28. Use a magic eraser to clean the bottom of dirty crayon bins. 29. Make a cheaper version of foam brushes using clothespins. 30. Cut a sheet of sandpaper to sharpen scissors. 31. Portable caddies makes distribution of materials as well as clean-up super easy. Your ticket to an organized art classroom starts here. For more elementary school teacher hacks, check out "Clever Classroom Tips" and "Money-Saving DIYs for the Classroom."